Before all that, however, it was essential to get your city off to the best possible start and, as I’ve already said, this was a far tougher task than it was in the original SimCity. So-called 'Reticulating Splines' were first introduced here as a means to calculate an entirely random landscape canvas upon which your city would be crafted. Wright coined the term, which would eventually be adopted as a catch-all for any environmental randomness algorithm used within game development. What such grandiose a description for a simple premise actually meant was that you could never be sure how much water and land relief would be present on your claim from the start. 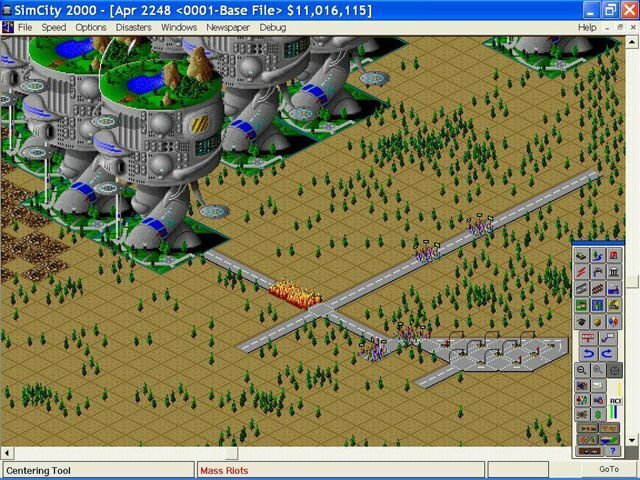 Just as well then that the SimCity 2000 engine allowed you to spin your viewpoint around through four set perspectives. Such natural features meant there was scope to sculpt your city in new and ever more gorgeous ways too. The lay of the land and areas of water allowing for studiously designed takes on Venice, or else the chance for wholesale terraforming according to personal taste. Replaying the game before writing this, I was also surprised by quite how tough it was to initially get Sims moving on in. Those most fussy of virtual people turning their collective nose up at any conurbation that had inadequate power and water supplies, a lack of a prerequisite amount of residential, commercial and industrial zones; not to mention something approaching a road network with links to surrounding towns. Cater to their whims, however, and your people will let their love be known, throwing parades in your honour - all of which are reported in the dependable local newspaper. Indeed the periodical was something of a triumph, the yearly editions offering an insight into the opinions of your people with such nuggets of advice as ‘Naysayers say nay’, among others. As before, natural – and not so natural – disasters would be unleashed upon your city to test the mettle of your emergency services, while scenarios appeared once again to push your mayoral skills to the limits, but it was the richness of your city that really made SimCity 2000 shine. Maxis added so much variation into the game’s residential, commercial and industrial zones, as well as specialised structures, that above all else it was just a sheer joy to watch your city grow. The ebb-and-flow of gentrification mesmerising the player, particularly if you played on llama or cheetah speeds which would have the years flashing by.